Playbook is a tablet device from BlackBerry (which is known for its Blackberry smartphones). This tablet can be easily paired and connected with BlackBerry smartphone for accessing phone data on the Playbook tablet device. First time users may want to know the procedure to turn ON or OFF the BlackBerry tablet device. Playbook has prominent Power button at the top which makes turning device ON very quick and easy routine. 1. Power ON – Check for Power button at the top of BlackBerry Playbook device next to multimedia controls for play and pause. To turn ON BlackBerry Playbook device, press and hold the Power button at the top. 2. Power OFF – Routine to turn OFF Playbook is similar to Power ON routine. To Power OFF, press and hold the Power button and then tap Turn Off on the screen. Please note – Playbook tablet does not charge when it is turned Off. You can keep eye on status of the battery (remaining charge) by tapping battery icon on the status bar of the Playbook. 3. Restart – You can easily restart Playbook tablet, press the Power button and then tap restart on the screen. 4. Standby Mode – You can easily put Playbook tablet in standby mode when not in active use for sometime. 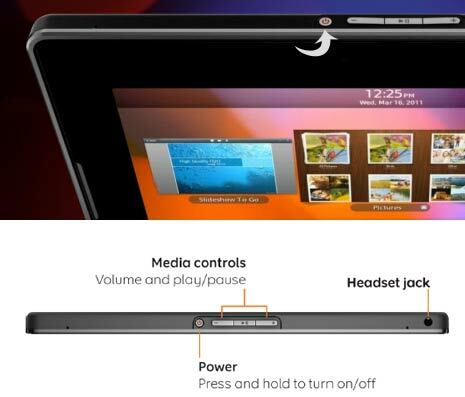 Power button is used to activate Standby mode on Playbook tablet. To enter Standby mode press the Power button at the top of the tablet device. To exit Standby mode, swipe down from the top frame to bottom frame.